Beneath the Tor seamlessly blends the mystical with the realities of every-day life into an absorbing and intriguing murder mystery. 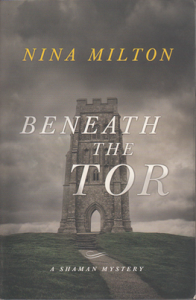 Set in the West Country, Beneath the Tor is the third of author Nina Milton’s Shaman Mystery series in which therapeutic shaman Sabbie Dare uses her shamanic skills to solve murder mysteries. But the Otherworld rarely gives a direct answer, as discovered by many a contemporary shaman. Beneath the Tor is a compelling and well-paced mystery which contains recognisable and authentic diverse characters illustrating their spiritual – and not so spiritual – aspects and features many of the issues that affect contemporary shamanism including the serious as well as the amusing (one of my favourite phrases is from a potential workshop participant stating “I’m already a shaman. I’ve done several courses.”[i]). The book also contains excellent descriptions of Sabbie’s shamanic journeys and of her work with her guide, an otter called Trendle. Writing a review for good fiction is difficult due to the tendency to get absorbed in the story, carrying the book with you everywhere, staying up late to ‘just finish this bit’ … and totally forgetting about the reviewing bit. And this was certainly the case with Beneath the Tor! An extremely original and engrossing novel – highly recommended! Nina Milton. Beneath the Tor. Midnight Ink (2015). ISBN: 978-0-7387-4382-0.